"Highway 61" opens up north in the Canadian hamlet of Pickerel Falls, where an earnest young man named Pokey Jones operates a barber shop and hangs out with his buddies. One day he discovers a frozen body in a bathtub out in the shop's backyard. He hauls the stiff into the shop and attempts to blow-dry him back to life, but nothing doing. Not long after, a girl named Jackie Bangs wanders into town and claims the dead body as her brother. We have reason to believe Jackie has never seen the body before. She's a roadie with a rock band, has stolen some drugs, and needs the corpse because it offers an ideal way to smuggle the drugs into the United States. She meets Pokey, who as discoverer of the body has made the front page of the local paper, and talks him into driving her and her "brother" to New Orleans. That's the setup for "Highway 61," a good-natured, oddball road comedy that travels from Ontario to Louisiana while hardly encountering anybody along the way who is not a prime candidate for one of those tabloid TV shows. Pokey, played by Don McKellar, is a likable small-town guy who dreams of making it into showbiz as a trumpet player. And Jackie (Valerie Buhagiar) is a survivor looking for the angles. What sets the movie apart from other road movies is the presence of another character, Mr. Skin (Earl Pastko). Mr. Skin is, in fact, Satan; he amuses himself and feeds his cynicism by seeing how cheaply he can buy human souls. Some souls change hands for as little as a bottle of whiskey. He takes Polaroids of his conquests and shuffles through them like a deck of cards on which he can perform unspeakable tricks. Most of the people Pokey and Jackie encounter along the way look like models for carnival sideshows. Among them is a father (Peter Breck) who runs a traveling troupe consisting of his three daughters, who talk in unison and dance in a disturbingly mechanical style like wind-up Barbie dolls. There are also incurious service station owners who are not any more intrigued than absolutely necessary by the way Pokey has to keep borrowing ice to put in the coffin that's strapped to the top of his car. One of the problems with a movie like this is that it has to end, which means the Satan business has to be resolved one way or another, when in fact the movie would be most comfortable just staying on the road indefinitely. 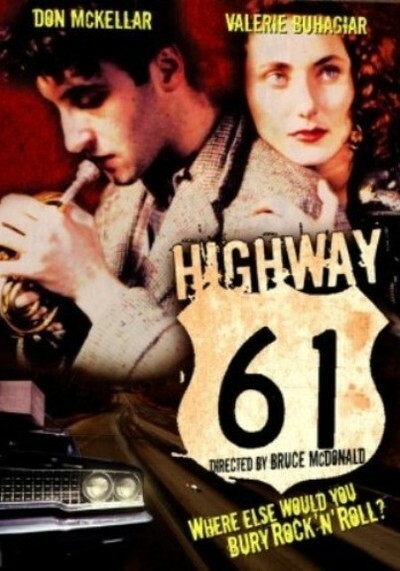 "Angel Heart," another devil movie that hit the road for New Orleans, had a neat twist at the end.But "Highway 61" does not take Satan quite seriously enough, I think, to give him his due. Instead, the movie ends sort of whimsically, as it began. What's good about it are the performances by McKellar and Buhagiar, who look surprisingly like real people and not like movie actors, and a rock sound track by Nash the Slash, a group (or person) previously unknown to me, that's fun to listen to. McKellar also wrote the movie, and puts in a lot of quiet little conversational twists, small whimsical observations and wistful asides, that are as insubstantial as the wind, but leave a nice lingering tone.